← Cromartie’s ex-fiancée can write! Well, maybe Mitch Kupchak wasn’t just lighting a fire under the Lakers when he put trade talks out there to the media last week. Chris Broussard of ESPN is reporting that the Lakers are interested in Carmelo Anthony. Now, my initial reaction is, “So what? Who isn’t? Hasn’t ‘Melo been traded to 8 different teams in the media over the past couple months?” But, let’s humor the thought. Rumor is that the main deal would be ‘Melo for Andrew Bynum. I would pull the trigger on that trade so fast it would make your head spin. Boom, trade, done. I love Bynum, but he’s a friggin’ china doll. He does the Lakers no good if he’s constantly sitting on the bench nursing an injury. I know his potential, I know he’s 7 feet tall, and I know he’s still just a kid, 23 years old. Well guess what, Carmelo is only 26 years old.. that’s young too, so the throw the age argument out the window. Kobe is 32 and still lighting up the Staples Center like the 4th of freakin’ July. Shoot, Kobe’s age is just one more reason the Lakers should love this deal…if they can get ‘Melo long term, they are gonna need a superstar to fill in when the Mamba’s time has come. Carmelo could be that guy. He was made for LA, hell, his wife’s name is LaLa. You can’t make this stuff up. Bring ’em to Hollywood! Sadly, when it comes to 7 footers… they are more likely to go the way of Greg Oden and Yao Ming than they are Wilt Chamberlain and Kareem. I know that detractors of this trade are thinking the Lakers can’t afford to go smaller against the big teams in the East (Magic/Celtics). Well, the Lakers have the rare luxury of having two 7 footers, and a 6’10” guy in Lamar Odom who should be on the All Star team, and would be starting on just about every team in the nation except for the Lakers. 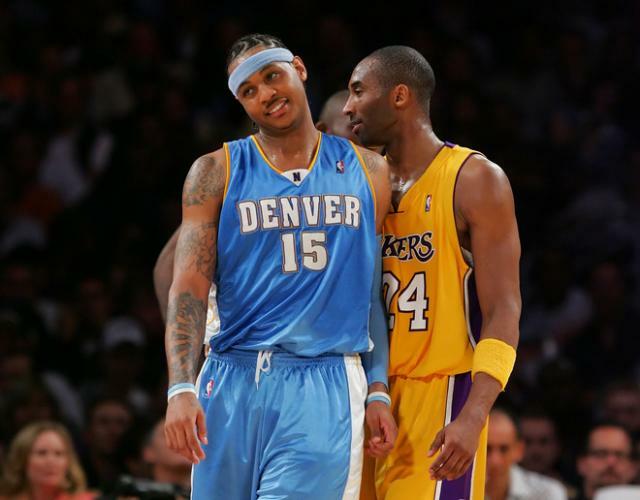 So, could Kobe and ‘Melo coexist? Why not? Lebron and D. Wade is working isn’t it? I’m salivating with excitement at the thought of D. Fish at point feeding the ball to Kobe, Pau, Lamar and ‘Melo. There’s plenty of time to mesh together before it’s time for a 3-Peat… if this thing is real, please Lakers, do the right thing, bring ‘Melo in. This entry was posted in Basketball, NBA and tagged Andrew Bynum, basketball, Carmelo Anthony, ESPN, Kobe Bryant, Lakers, Lamar Odom, Melo, NBA, Nuggets, rumor, Staples, Trade. Bookmark the permalink.